Solar cooking is done by means of the suns UV rays. A solar cooker lets the UV light rays in and then converts them to longer infrared light rays that cannot escape. Infrared radiation has the right energy to make the water, fat and protein molecules in food vibrate vigorously and heat up. It is not the sun’s heat that cooks the food, nor is it the outside ambient temperature, though this can somewhat affect the rate or time required to cook, but rather it is the suns rays that are converted to heat energy that cook the food; and this heat energy is then retained by the pot and the food by the means of a covering or lid. This occurs in much the same way that a greenhouse retains heat or a car with its windows rolled up. An effective solar cooker will use the energy of the sun to heat a cooking vessel and efficiently retain the energy (heat) for maximum cooking effectiveness. How solar cooking works can best be explained through the following mental diagramming of the process as well as the above images. First, you would need a darkened or blackened pot with a lid. This can be a pot such as a cast iron Dutch oven, a black enameled roasting pan such as a chicken or turkey roaster or any pot that you might blacken on the outside with a non-toxic, weatherproof paint.Dark surfaces become very hot; they heat up more quickly than shiny surfaces. Then you will need to obtain a clear transparent covering such as a large glass bowl or a durable plastic oven cooking bag.This will be used for retention of heat and will also allow the rays of the sun to be able to penetrate to the darkened cooking pot and food,thus raising the cooking temperatures and preventing the heat from escaping. Next you will need a material that will reflect extra sunlight towards the cooking apparatus so as to concentrate the suns rays. This is usually accomplished in the form of some type of reflecting surface such as mirrors, aluminum foil and buffed tin or sheet metal. With the help of a reflecting surface you will be able to increase the temperatures and to cook the food more rapidly. ...For maximum efficiency it is necessary to "track" the sun, or in other words adjust your solar cooker so that it is directly towards the sun in order to be able to better concentrate and absorb the suns rays. This does not mean that you must continually stand beside the solar cooker the whole cooking period. But it can mean adjusting the angle and direction every so often or every set period, such as every one to two hours. The more direct that the sun's rays are towards the food and cooking pot the greater the energy (heat) capacity will be from the sun's converted rays. Ideal cooking results when using a solar oven occur when the sun is bright and uninhibited or unimpeded by clouds, shadows etc. Cooking can be accomplished as well on days when the clouds are high and thin, but it may slow things down a bit, and one would be wise to start a little earlier than usual. Baking on the other hand will take longer and the temperatures will not be as optimum as could be, thus resulting in mixed outcomes with your baked goods. Absorption (ability to attract or hold heat. Concentration of the sun's rays is performed most often by reflecting panels, petals and such surfaces that can "focus" or concentrate the rays of light (UV) to a point or concentration.These reflecting panels are usually made of materials that are shiny and reflective due to the substance used in their manufacture, such as silver, chromium and aluminum.Without a means to concentrate the sun's rays it can take longer to heat objects or surfaces, thus most solar cookers are constructed with reflector panels to speed up the process of heat accumulation. 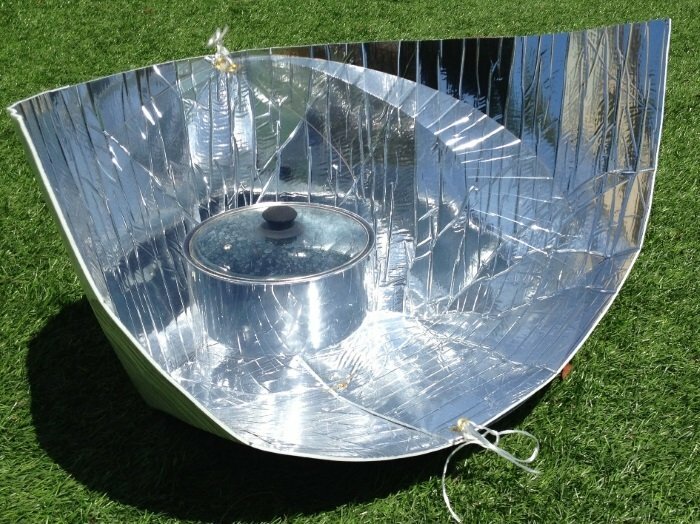 Absorption of the sun's energy (heat)in solar cooking is best achieved when a surface is dark in color, thus the most common solar oven interiors are usually black in color as well as the color of the cookware used for cooking the food. Dark colors absorb the heat, whereas light colors do not absorb heat well. And some colors can reflect the sun's energy away, such as silver for example. Generally, the best cookware for solar cooking is the dark, thin variety because it absorbs the heat (energy) well; and because it is thin, it can then transfer the heat more quickly and evenly to the food. Retention is the final principle in solar cooking.If a solar cooker is not well insulated and if it does not have a cover, or lid, then all of the concentrated heat (energy) and all of the absorbed heat would quickly dissipate into the air and be lost to the surrounding environment. A solar cooker must have the means to "trap" or hold the concentrated heat allowing it to accumulate and to "build up" to sufficiently high enough levels to be able to effectively cook. * * A fourth principle, though not vital in all forms of solar cooking (parabolic cooking is one) is: transparency of your retentive materials, or in other words, your lid on a solar oven or your enclosure around your pot/pan on a solar panel cooker needs to be able to allow the sun's rays to penetrate inside to where the food/cooking vessels are located. This ability of the sun to penetrate is usually achieved by using clear glass, or plastic coverings on a solar cooker lid/door/enclosure which then in turn acts as an inhibitor, trapping the heat as well. Plans and guides for making a solar cooker. 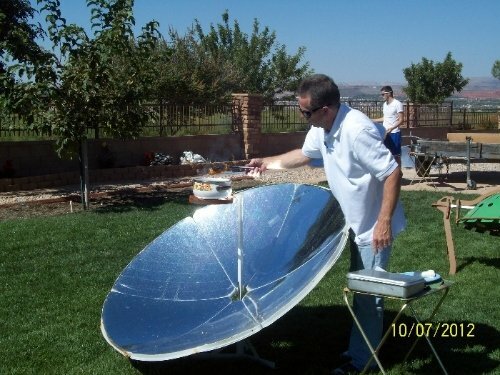 Solar Cooking: When is the Best Time? Can You use a uv flashlight and the sun to cook food? My question is if you can make a full glass solar oven with reflective panels on the side? Will this work? Are there any chain stores that sell solar cookers? Are there any chain stores that sell solar cookers along with instructions for their use? I never see solar cookers myself but I wonder about the chore of cleaning after cooking if any? What kind of materials best absorb heat from the solar cooker? What other insulators can I use for my solar oven? I know you can put rolls of newspaper in the solar oven, any other cheap insulators like cotton balls or something? why would you use plexiglass instead of saran wrap? What degrees of the panel should we put to make the solar panel reflect heat efficiently? why we use solar cooker ? 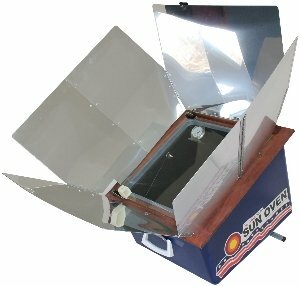 Which interior is better for the inside of theSolar Oven? Anybody know about sun tracking devices? What sizes of Granite Ware Pot will fit into the Sun Oven? 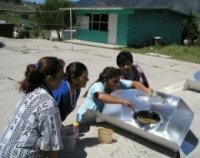 What energy transformation takes place in solar cooking? what type of radiation passes through the box?